Rome is like a tapestry of time. Ancient Roman ruins blending into medieval churches, Renaissance domes, Baroque fountains and fascist buildings, whilst the vivacity and vigour of modern Rome sparkles in the foreground. Eternal Roma. Time from all times stand here on display. Ancient Romans, Vandals, Popes and the Borgias, Michelangelo and Bernini, Napoleon, and Mussolini, all have left their physical and spiritual mark on this city by the banks of the river Tiber. Modern Rome has one foot in the past and one in the present—a wonderful stance that allows you to have an expresso in a square designed by Bernini, then walk back to your hotel room in a renovated Renaissance palace. The Vatican has been the residence of the Popes since 1377. Before the pontifical court moved to Avignon, albeit temporarily (1309-1377), the headquarters of the Pope had been at the Lateran. Since 1377 there has not been a single Pope who has not contributed to the grandeur and dignity of the Vatican, to make this holy hill the Supreme Head of the Catholic Church. An uninterrupted succession of 265 men have sat on St. Peter’s throne, many of whom were martyrs and saints. The Vatican has been an independent state (called the Vatican City) since 11 February, 1929 when the Lateran Treaty resolved the issue between the Church and the Italian state. In Roman times, the Vatican was the site of the Great Circus of Nero, where under Nero, St. Peter was crucified (64 BC-67 AD). His body was buried nearby. More than 250 years later Constantine built a magnificent basilica on the spot, which was destined to become one of the marvels of the world. It was Pope Julius II (1503-1513) who began the construction of a new basilica, entrusting Bramante with the design of the architectural project which took 176 years to complete. Until Michelangelo, then almost 70 years old, began to build the dome, there had been a succession of various architects, among them Raphael, Peruzzi, Antonio Sangallo the Younger, and different plans. After Michelangelo’s death, work went on according to his original designs which were based on Bramante’s Greek cross plan. However, under the papacy of Pope Paul V (1605-1621), Maderno decisively adopted a Latin cross design for the new basilica. 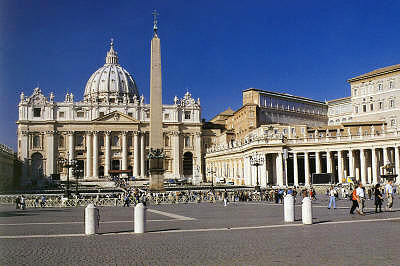 The greatest church in Christendom, St. Peter’s Basilica stands in the grand St. Peter’s Square. The physical statistics of Rome’s sublime sanctuary are staggering: it runs 211.5 meters in length up to the portico; Michelangelo’s dome rises 136 meters high and is 42 meters in diameter. The square is the largest in Rome measuring 314 by 240 meters. The colonnade lining the square is Bernini’s most beautiful work and forms the solemn entrance to St. Peter’s and the Vatican. Bernini also designed the 140 statues of saints which decorate the colonnade and were sculpted with the help of his students. The obelisk in the centre measures more than 25 meters high and was brought from the nearby ruins of the Circus of Nero by Pope Sixtus V. The two fountains outside harmonise beautifully with the square. The Borghese Pope Paul V commissioned Maderno to construct the broad facade of the church and had his name and title written in very large letters across the entablature. Eleven apostles flank Jesus as they stand in a row on top of the facade. The place of Judas Iscariot, the apostle who betrayed Jesus, is taken by John the Baptist, the Messiah’s cousin. Impressive statues (19th Century) of St. Paul [left] and St. Peter [right] stand in front of the basilica, serving as a reminder that both saints were martyred in Rome. St. Peter holds the keys which symbolise the spiritual authority which he received from Jesus. Was it art that lifted god, or god that exalted art. Christianity has always been a great source of inspiration to art, and nowhere is it more apparent than in the frescoes, murals and sculptures that adorn the churches throughout Italy, and most specifically St. Peter’s. Five doors open onto the portico, corresponding to the five aisles of the church. The Door of Death is to the extreme left, in the centre is the Bronze Door, and the Holy Door is to the far right which is only opened every 25 years at the beginning of the Holy Year. On Christmas Eve, the Pope according to a special ritual, makes a solemn procession to the door. After kneeling three times and hitting the wall with three strokes of the hammer, the wall is removed and the Pope crosses the threshold to enter the basilica followed by his entourage. At the end of the Holy Year, the door is re-sealed with a formal ceremony. Inside St. Peter’s are Bernini’s famous 29-meter high baldacchino [canopy] over the papal altar, and the papal throne. The high altar under the cupola rises above the tomb of St. Peter. In front of the tomb 99 lamps burn day and night. Coloured marble and beautiful mosaics adorn every visible surface. 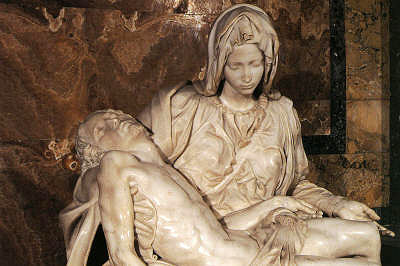 Michelangelo’s Pieta, placed by the right wall, was sculpted between 1498-1499 when he was just 23 years old. The artist’s name is engraved on the sash that crosses the bust of the virgin. Other masterpieces in the sanctuary are various marble and bronze sculptures, the most celebrated being that on the tomb of Pope Alexander VII by Bernini. The artist was nearly 80 years old when he designed it. Bernini had been one of the innovators of the Baroque style and this is a good example of its extravagant ornateness and sense of drama. The Pope’s gesture celebrates his devoted asceticism. The figures of Charity and Truth are in the foreground with Justice and Prudence in the back. Under the pink marble folds, death looms holding an hour glass representing time. Also of remarkable artistic value are the mosaics on the walls recreating various celebrated works such as the Transfiguration by Raphael made with enamel and glass pieces in over 20,000 different colours. Near the transept is the celebrated 13th Century bronze statue of St. Peter. The faithful silently file by, hold his feet and pray. I had only one prayer, a prayer of gratitude. That I had made my way to all this beauty. To its right is a small chapel, the Chapel of the Sacrament with Bernini’s gilt bronze angels. It was beautiful. The peace palpable. I loved St. Peter’s. I went there twice, both starting and ending my trip through the country with it. Even bought a rosary made of crushed rose petals at one of the Vatican shops and stood in the square for the papal blessing. The Pope appeared at his window [second from right on the third floor], muttered a few words, and voila! we were blessed. There were thousands of us in the hot afternoon sun, all eyes fixed on him, raising rosaries and crosses towards him for his blessings. I’m not too sure when the defining moment exactly happened, but the sea of humanity bound by faith was sacred and touching in its own self. The Vatican Museums are exceptional, both because of the richness and prestige of the masterpieces brought together by various Popes over the centuries, as well as for their sumptuous setting. The museums are made up of a group of grand buildings comprising countless rooms, salons, galleries, libraries, chapels, corridors, courtyards and gardens. Highlights include the helicoidal staircase by Giuseppe Momo based on Leonardo’s design; Museo Pio Clementino with the lacoon group, Apollo, and other classical works; Stanze di Raffaello [Raphael Rooms]; the Tapestry Rooms with Flemish tapestry reproductions of Raphael’s works; Room of Maps; the rooms containing gifts to the Vatican, the most interesting being pieces of the moon brought back by the first expedition to it; and the Cappella Sistina [Sistine Chapel], the private chapel of the Popes. The Popes are elected by the Cardinals. Black or white smoke from the chimney of the chapel proclaim if a decision has been made or not; black for no, and white for yes. 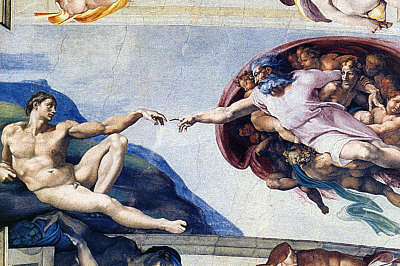 Pope Julius II commissioned young Michelangelo to paint the ceiling of the Sistine Chapel in 1508. Michelangelo, who considered himself a sculptor and not an artist painted the area of 800 square meters lying on his back over a period of four years, against his wishes and hopes, grudgingly following the orders of the Pope. The rich complexity of Michelangelo’s artistic genius shines through in this masterpiece. He covered the actual architecture by painting over it an architectural structure in which he set the various figurative elements with an amazing three dimensional effect. In the centre of the complex design are a sequence of nine panels showing episodes from Genesis, flanked by the famous ignudi [nudes], and portray: The Separation of Light and Darkness, Creation of the Sun and the Moon, Dividing the Waters from the Land, Creation of Adam, Creation of Eve, Original Sin and Expulsion from Eden, Sacrifice of Noah, Deluge, and the Drunkenness of Noah. Prophets and Sybils fill the triangular spaces at the curves of the vault. The side walls are covered with scenes from the Old and New Testament by Sandro Botticelli and other leading artists of the time. A good 23 years passed, during which the Christian world was torn apart by the Lutheran Reformation and Rome suffered the terrible sack of 1527, before Michelangelo painted the Last Judgement on the wall behind the main altar. Commissioned by Pope Paul III, it was began in 1535 and completed in 1541. A compendium of the Divine Comedy, 300 figures swarm in a composition which has an amazing coherence and clarity and in which space is organised into an architectural structure of figures. Christ, the implacable judge, dominates the scene. The Virgin beside him is the ever-living link between Christ and humanity. On the left is the scene of the resurrection of the dead, whilst a group of angels in the centre bear the book of judgement and blow trumpets. As the good rise to heaven, the wicked are thrown into the abysses where Charon shoves them out of his boat and Minos the judge of hell awaits them. To be observed is Michelangelo’s sorrowful self portrait in the folds of the flesh on the face of the martyrdom that St. Bartholomew shows to the Judge. Between 1980 and 1994 a large scale restoration of the frescoes on the ceiling and Last Judgement were carried out. By dissolving the heavy layers of dust and lamp deposit laid over the centuries, the in-depth cleansing brought out the most brilliant colours to light. The Vatican is one of the wealthiest countries in the world due to the generosity of one man, Mussolini. The Lateran Treaty (1929) gave the Vatican full protection, financial assistance to the tune of US$85 million, and complete freedom from taxes. It also allowed the Vatican to hold property outside the country, for example the basilicas and catacombs. Mussolini made it compulsory for Catholicism to be taught in schools. A percentage of 1.5 is currently deducted from the monthly incomes of registered Catholics throughout the world. The Vatican is interestingly the single largest landowner globally. It owns 1/12th of Manhattan. This entry was posted in Exploring our World, Italy and tagged Michelangelo Last Judgement, Michelangelo Pieta, Michelangelo Sistine Chapel, St. Peter’s Basilica, Things to do in Italy, Things to see in Rome, Vatican, Vatican Museums by Rama Arya. Bookmark the permalink.